Singer and fashion designer Lily Allen recently married Sam cooper in a typical village wedding, their ceremony took place at St James the Great , a picturesque church in the Cotswolds. Lily wore a vintage style dress by French designer Delphine Manivet, it featured a sweetheart neckline with lace sleeves and overlay with a long train. She also wore a full length 1920s veil adorned with two large flowers. Lily carried a gorgeous bouquet of country garden flowers in soft pastel shades. Her bouquet featured garden roses, spray roses, peonies, hydrangea and field pennycress. Her bridesmaids wore floaty peach dresses and carried small version of Lily’s bouquet. The flower girls wore ivory lace dresses and wore circlets of flowers in their hair. Either side of the entrance to the church there were two large arrangements of garden flowers in blues, purples and whites including delphinium, peony, hydrangea, scabious and viburnum. A palette of pastel colours is perfect for a vintage themed wedding. If you want to achieve the same classic look, pick flowers such as stocks that are available in lovely pastels shades including pinks, lillacs and creams. Scabious is another pretty garden flower, in either soft blue or white. 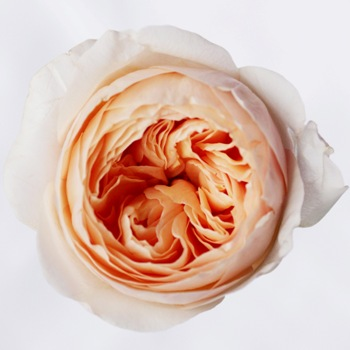 Lily Allen had gorgeous garden roses in peachy apricot tones, the David Austin rose Juliet is a lovely peach garden rose.